Little-brother antics have never been so endearing -- or true to life! 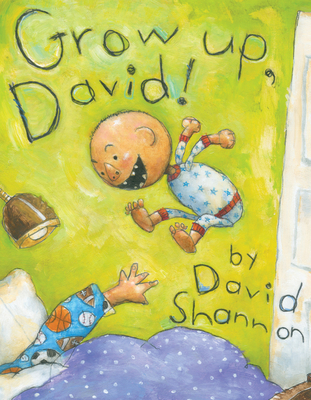 David Shannon's beloved character in his bestselling book No, David! captures the attention and hearts of young children as few characters can. Readers relish David's exuberance, defiance, and wildly energetic curiosity, and when there's trouble, you can bet "David did it!" Now he's taunting his older brother by eating his Halloween candy, making a bathroom mess, and following him up the tree house. "You're too little!" won't stop David's tricks in this all-time "read it again" favorite. With millions of copies in print and four sequels, No, David! hit the ground running in 1998 and was a Caldecott Honor Book, a New York Times Best Illustrated Book, and a classic for 20 years. Based on a book the author wrote and illustrated when he was five, David captures the timeless no-no's familiar to every child. Grow Up, David! is nothing short of exhilarating. David Shannon is the internationally acclaimed creator of more than 30 picture books, including No, David!, a Caldecott Honor Book and his second New York Times Best Illustrated Book of the Year, and four more David picture books. Shannon's bestsellers include A Bad Case of Stripes, Duck on a Bike, and Too Many Toys! His most recent book is Bizzy Mizz Lizzie. He lives in California with his family.